The gene Granulocyte-Macrophage Colony Stimulating Factor (GM-CSF) encodes a cytokine, a signaling molecule secreted by immune cells that has an effect on other cells and is involved in inflammation. A recent report in Cell Host and Microbe reveals that in the gut, GM-CSF helps protect against infection by a bacterial pathogen . GM-CSF has long been known to promote the survival and differentiation of dendritic cells, immune cells that are present in small quantities in tissues that are in contact with the external environment, including the skin and the inner lining of the nose, lungs, stomach and intestines. 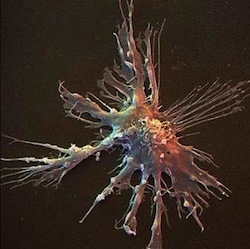 Dendritic cells are immune modulators that originate in the bone marrow and travel through the blood and lymph to the peripheral tissues in an immature state. Once they arrive, they differentiate and function as professional “antigen presenting cells”: they alert T cells and B cells to the presence of any foreign invaders. The T and B cells then mount an immune response.